Advanced imaging & analytical spectroscopy applications in the life sciences and materials sciences need light sources capable of providing extremely high brightness across a broad wavelength range. Traditionally, multiple lamps (Halogen/Tungsten, Xenon-arc, Deuterium) have been used to cover this broad spectral range. However, combining multiple lamps is costly and optically inefficient, and the use of electrodes within these lamps limits their ability to achieve the high brightness or power needed for the most demanding applications. Furthermore, traditional electrode-driven light sources have short life, need to be changed frequently, and during their life the lamp output declines constantly. To address these problems, Energetiq has developed a revolutionary single-light source technology called the LDLS™ Laser-Driven Light Source that enables extreme high brightness with a relatively flat spectrum, from deep ultraviolet through visible into the near infrared, combined with life-time an order of magnitude longer than traditional lamps. 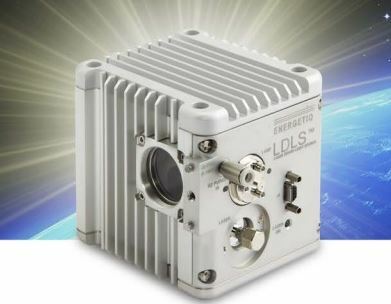 The LDLS EQ-99XFC has integrated collection optics that allow greater ease of use for those needing a fiber connection. The high performance ellipsoidal collector ensures that the ultra-high brightness light and power stability are maintained across the broad spectrum, from 190nm to 2100nm, and efficiently coupled into small diameter optical fibers. Proprietary Fiber-Protection Technology™ enhances DUV performance and significantly extends fiber life by reducing the effects of solarization. Utilizing a patented laser-driven bulb technology* and ultra-clean construction, the EQ-99XFC is ideal for applications requiring ultra-long lamp life combined with high broadband brightness.